One of my dog Valentino's favorite spots in the house is the front room window which looks out on the front porch and the city street beyond. He enjoys napping there, especially when the sun is shining through the windows on the front of the house. It is also my guess that my hound dog is afraid he might miss something going by so he likes being near the action outside the window to his world. Whatever the reason my dog prefers this spot to sleep, I think it time he gets an official dog bed upon which to rest his hound dog head. Along with dog beds that are comfortable, my dog Valentino also likes a pillow while sleeping. He uses mine when sleeping in my bed and he has a small throw pillow in his crate too. Now I have designed an accent pillow with my hound dog's sleeping face upon it! 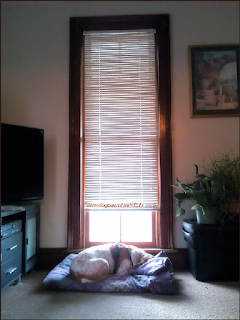 With a new dog bed and pillow, surely Valentino will enjoy sleeping in style at his favorite spot in the living room, or just being comfortable as he gazes out the window at passersby. Disclosure: Ruth Cox is an associate of Amazon and Zazzle affiliate and may earn commissions via purchases made through links in this article. 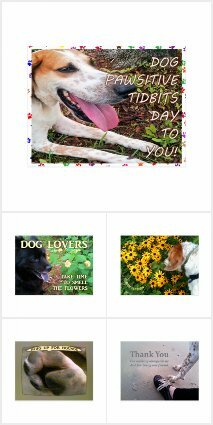 We invite you to join us each week of the year here at Dog Pawsitive Tidbits for PAWSit Hop Saturday, a blog hop for you to share your dog paw prints and tails with us!